Beths Bothy at Drumwall in Gatehouse of Fleet, Dumfries and Galloway sleeps 2 people. Drumwall in Gatehouse is set in a beautiful rural location on the owner’s working farm, this pod-style property is only a mile from the charming town of Gatehouse of Fleet offering a wide range of places to eat and relax in. There are numerous attractions in and around the town including the Mill on the Fleet Visitor Centre, Cardoness Castle and the popular Laggan Outdoor Activity Centre, which is host to one of Europe’s longest zip wires. Only a short drive away, Kirkcudbright is known as ’the artists’ town’ and attracts visitors throughout the year who are drawn by the harbour, historic high street and the diverse range of annual events and visitor attractions. The popular programme of summer festivities culminates with the spectacular Tattoo, an event not to be missed. Close by, there are delightful beaches and numerous walks available, from scenic coastal walks to forest trails, not to mention sailing, swimming, riding, fishing, golf, boat trips and water sports, there is something for everyone. Warmed by the Gulf Stream, there are many beautiful gardens to visit, including Threave Gardens (National Trust). Close to the Galloway Forest Park and central to 5 of the 7Stanes, it is a popular location for cyclists and mountain bikers. The beach is 3 miles from Drumwall in Gatehouse. With the shop, pub and restaurant being 1 mile from Drumwall. Beth’s Bothy can be booked together with Galloway View (ref 537210), Cairnsmore Cottage (ref 537269) and Jack’s Hideaway (ref UK5530 [Jacks Hideaway]) to sleep up to 14 people. Ground Floor: Beths Bothy is all on the ground floor. Living area: With Freeview TV and patio doors leading to decking. Electric central heating, electricity, bed linen and towels included. Welcome pack. Laundry room (shared with other properties). Decking with sitting-out area and garden furniture. Hot tub for 2 (private). Bike store. Private parking for 1 car. No smoking. Holidays at Beths Bothy, Drumwall run from Friday to Friday. For a better idea of where Drumwall - Beths Bothy is, you can see Drumwall - Beths Bothy on the map below. 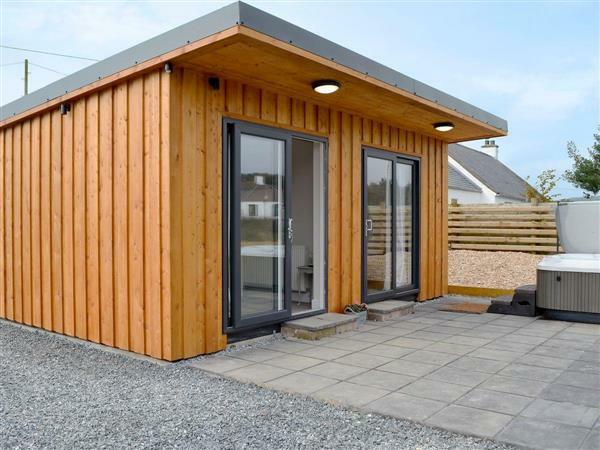 Drumwall - Beths Bothy is in Kirkcudbrightshire; should you be on the lookout for a special offer, you can find all the special offers in Kirkcudbrightshire. It's always worth checking to see what is on offer at the moment. Do you want to holiday near Drumwall - Beths Bothy (UK5529), you can see other cottages within 25 miles of Drumwall - Beths Bothy; have a look to find your perfect holiday location.